This is a competition for the Renovation of hydraulic Museum. 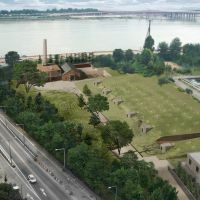 The site locates next to the Han-river and it was once used as a water purification plant. There remained the buildings and structure, so what matters are how to deal with them and add new parts. The only building which functions now is the main Renaissance style building as a museum and we decided to keep as it is, instead extend the building and put the new function of info center, café’, gallery and view tower. Respecting the aesthetic value of the existing vault structure underground space which contained the water before we convert the space into the aqua gallery and it will function as a temporary exhibition gallery, an event hall, and facilities. The site and existing structure themselves are the part of the memory of industrial era and we create here the hybrid topos which can be linked to the future.